The very first Durham & Sunderland One Act Festival takes place from 7th to 10th March at Arts Centre Washington. Each year around 25 drama festivals are held around the country as part of the All England Theatre Festival. Amateur drama groups enter these festivals, normally held over three or four days, and on the final day a professional adjudicator decides which group should go forward to the next stage, a regional final, this year to be held in Port Sunlight. From there a winning group will go on to an All England Final, in Stoke, and beyond that to a UK Final, in Stirling. 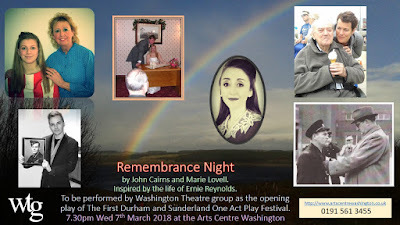 Until now there has been no festival north of Richmond and Saltburn but this year the 1st Durham & Sunderland One Act Festival will be held, from 7th to 10th March, at Arts Centre Washington. This new festival is being organised and sponsored by Alan Godfrey MBE, who for several years has been an actor and producer with Durham Dramatic Society. Seven theatre groups are taking part in this inaugural festival, with plays varying from Shakespeare to modern work written specially for the occasion. 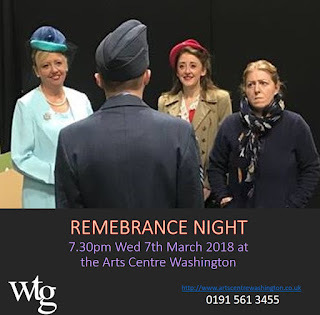 Washington’s own theatre group will be presenting a specially written piece, ‘Remembrance Night’, by Marie Lovell and John Cairns, while Durham’s well known Dramatic Society will be staging a 2-hander, ‘Grannies’, by Jean McConnell. Alan himself will be producing ‘Night Watches’, a rare chance to see a play by the Durham-born author Allan Monkhouse, who perhaps deserves to be better known in his home county. Other productions include new plays by local authors Tom Casling, Chris Masters and Lee Stewart, all competing for a New Writing Award, while the long established Durham Shakespeare Group will be staging ‘Julius Caesar Part 1’ – if you love Shakespeare but are sometimes daunted by the length, this 50 minute self-contained version might just be the answer! There are two plays a night with just one on the Saturday, followed by the awards, which will include trophies for Best Actor and Best Actress, all to be decided by the adjudicator, Sue Doherty – the overall winning play will then go forward to represent the region in the Northern Regional Semi-Final in Port Sunlight – then potentially the All England Theatre Festival Final in Stoke on Trent. Durham & Sunderland One Act Festival - 7th to 10th March at Arts Centre Washington, tickets are just £5 a night and are available from www.artscentrewashington.co.uk or by calling the Arts Centre Washington box office on 0191 561 3455 .